Abu Dhabi: How many times have you heard a fire alarm and ignored it? Only seven alarms were actual fires. All these incidents were confirmed within five seconds following which fire fighters were rushed by Civil Defence teams in less than a minute and-a-half. As soon as a fire alarm signal is transmitted to the Hassantuk operation centre, the system automatically dials the building owner or the security guard whose number is registered with the system, officials said. Atif Al Braiki, director, Strategic Projects, Injazat Data Systems, said false alarms are often caused by faulty smoke sensors or configurational issues in the fire alarm panel.” So far, more than 2,500 fire alarms were received at the operation room, in which half turned out to be false fire alarms. This is the major challenge, that’s why, we are carrying out a countrywide awareness campaign among residents,” Al Braiki said. The Ministry of Interior has tasked Injazat to link all commercial establishments and buildings in the UAE with Hassantuk. So far over 5,000 buildings have been linked to the system with 80 new buildings added to the system daily. The entity hopes to link all 150,000 buildings in country by 2021. 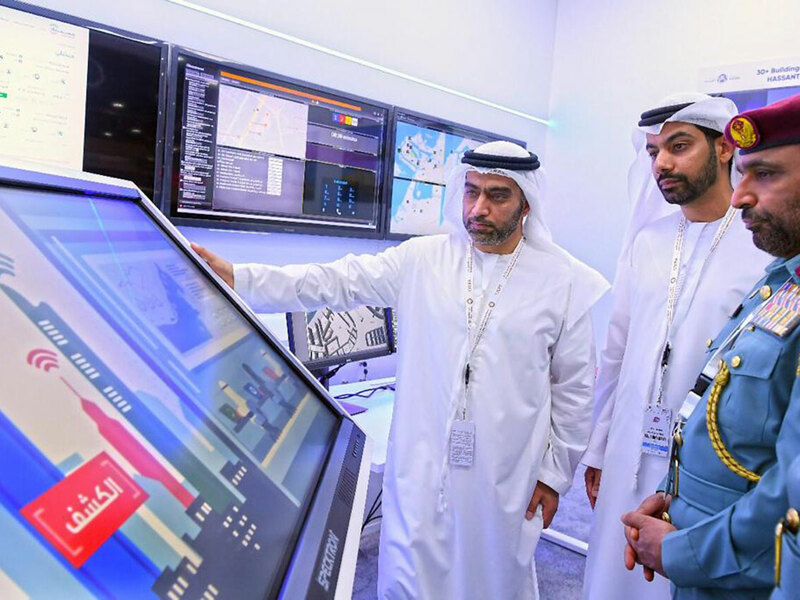 Buildings are displayed on giant screens at the Hassantuk operations room in Abu Dhabi and can be tracked with a single click as their icons turns red when they emit a fire signals. “Since July 2018, we have surveyed over 15,000 buildings for fire safety. Those found lacking have been reported to Civil Defence,” he said. Old towers across the country are a big challenge but Hassantuk rectifies snags along with Civil Defence and the ministry teams to make it fit for fire alarm system installation. “Currently we have been carrying out mass surveys of residential and commercial buildings across the UAE and already we surveyed over 15,000 buildings so far from July 2018,” Al Braikisaid. “In our surveys, we found that some of old buildings were well-maintained while others had fire alarm snags. If there is any fault, it needs to be fixed first before installation of the Hassantuk system,” he said. “We report to Civil Defence about the old buildings with severe challenges, so the Civil Defence approaches the building owners for fixtures,” Al Braiki said. A cutting-edge building safety system that links homes to Alarm Receiving Centre (ARC) where an alarm verified in less than 120 seconds. This project by Ministry of Interior aims to link more than 500,000 buildings and homes with Civil Defence. On October 2017, the MoI in partnership with Injazat Data Systems, unveiled Hassantuk for residential and commercial towers, the UAE’s smart fire monitoring, alert and control system and on October 10 in 2018, it launched another smart fire safety project for villas to provide end-to-end fire safety solutions to every villa in the UAE. It’s called “Hassantuk for Villas”.